Samuel was a major general in the Confederate army during the American Civil War. He was born at “Woodfield,” his parents’ plantation in Powhatan County, Virginia. He graduated from the US Military Academy in 1841 and was brevetted as a second lieutenant in the Second Artillery Regiment. He was initially posted to Houlton, Maine, during a boundary dispute with Canada. He returned to West Point (1846–1851), where he was assistant professor of mathematics and a tactics instructor. Immediately prior to the American Civil War, he was on the staff of the Judge Advocate of the Army in Washington, DC. With the secession of Virginia in 1861, Jones was commissioned as a major in the state corps of artillery. He later joined the Provisional Confederate Army and served as chief of artillery and ordnance. He was promoted to colonel in recognition of his service and, on July 21, 1861, to brigadier general. He was promoted to major general on March 10, 1862. From December 4, 1862, until March 4, 1864, Jones commanded the Department of Western Virginia, with his headquarters at Dublin, Virginia. 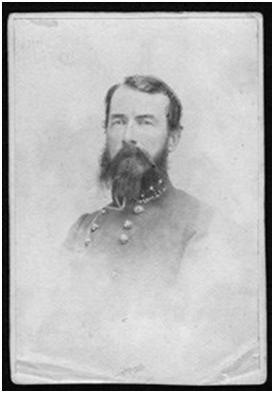 He was in general charge of the operations in defense of the Virginia and Tennessee Railroad and the vital salt mines. The September 1863 battle of Blountville was the initial step in a Union attempt to force Jones and his command to retire from East Tennessee. Jones was replaced in favor of Gen. John C. Breckinridge. He then commanded the district of South Carolina until January 1865. When the Union navy began shelling Charleston, South Carolina, Jones placed fifty captured federal officers brought into town under guard. He then advised Union Maj. Gen. John G. Foster to stop the bombardment unless he wanted to risk killing his own men. An irate Foster retaliated by placing captured Confederates, including Brig. Gen. M. Jeff Thompson, directly in the line of fire from Jones’s guns. In February 1865, Jones was named the commander of the Department of Florida and South Georgia, a post he held until the end of hostilities, when he surrendered at Tallahassee on May 10, 1865. From 1873 to 1875, Jones served as president of the Maryland Agricultural College. Jones died in Bedford Springs, Virginia. Source of information: Eicher, John H., and Eicher, David J., Civil War High Commands, Stanford, CA: Stanford University Press, 2001, ISBN 0-8047-3641-3. Jones, Samuel, The Siege of Charleston and the Operations in the South Atlantic Coast in the War Among the States. New York: The Neale Publishing Company, 1911. http://www.archive.org/stream/siegeofcharleston00jonerich/siegeofcharleston00jonerich_djvu.txt.